Dubai loves to surprise us. World famous for its ambitious projects, there’s a man-made island in the shape of a palm tree, the world’s tallest skyscraper, and coming soon…a fleet of irresistible Renault Twizy’s. 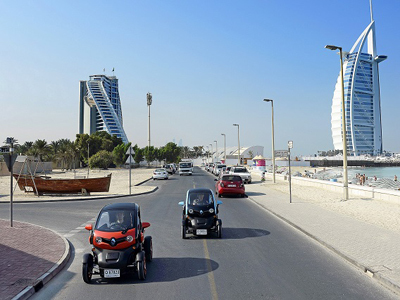 Here in the land built on oil, the emirate is bringing to life its commitment to electric mobility. Yes, Dubai is serious about promoting electric vehicles. You certainly have to admire their taste in cars. The Twizy is a fun clean way to get around, and a brilliant way to enjoy the plentiful supply of sunny days. Starting “small”… with 100 recharge stations! From mid-2014, the Smart Dubai project is being deployed with an infrastructure of 100 recharge points across Dubai. In a country that measures just a little over 4,100 km2, that works out at one recharge station for every 41 square kilometres. For this first stage of the project, the emirate’s energy supplier, Dubai Electricity and Water Authority (DEWA), will take a year to install the recharge stations. They will be spread across Dubai in a series of handy locations thanks to DEWA’s partnership with establishments that include car dealerships, airports, shopping centres, service stations, hotels and parking stations. 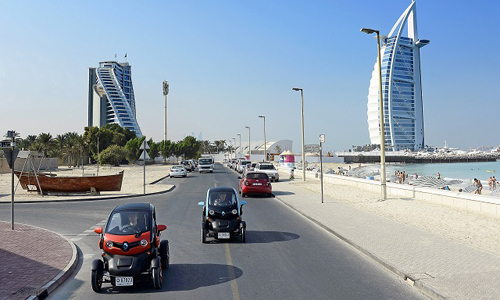 Dubai residents may find the invasion of the Twizy more than a little surprising. These aliens are landing in a part of the world where electric vehicles are as rare as hen’s teeth. Determined to switch people on to this new way of thinking, DEWA plans to build its own fleet of electric vehicles, going from zero to 100 in the coming two years. Recently in Dubai, Twizy has been popping up in some unexpected places. 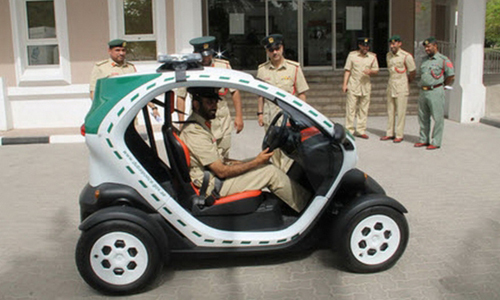 Last year, a Twizy was seen in the official Dubai Police Department’s colours – it stood out from the rest of the fleet which includes Ferraris, Bugattis and Lamborghinis. In November, during the Formula 1 Grand Prix, F1 stars Mark Webber and Charles Pic were spotted testing the streets of Dubai at the wheel of a Twizy. And on the 2nd of December, Twizy was treated to an invitation from the Royal Family to help celebrate the United Arab Emirates’ National Day. Emiratis haven’t seen the last of this plucky little head-turner!